Last week, eight human rights protesters won a historical legal victory against DSEI, the world's biggest arms fair. This is a remarkable milestone on the way to banning such shameful events, argues Andrew Smith. Last Friday, protesters and the media poured into Stratford Magistrates Court. Though a small court usually hosting neighbourly disputes and family proceedings, it was last week host to a week-long probe into the conduct and legality of the DSEI arms fair, which takes place in East London every two years. In the dock were eight peaceful protesters who had been charged with blocking the roads to stop the weapons from entering the event last September. UK courts have rarely been friendly towards anti-arms trade campaigners, so many expected the proceedings to be a foregone conclusion. However, it quickly became clear that this was not going to be an ordinary trial. Arguing that they were acting to prevent greater crimes from taking place, the protesters offered a political defence that quickly turned the tables on Clarion, the company in charge of organising the DSEI, and put UK arms export policy under the microscope. The court heard about illegal weapons being advertised at previous events, UK arms being sold to despots, like the Saudi regime, for use in war zones, and UK complicity in the oppression taking place in countries like Bahrain and Turkey. The activists were supported expert witnesses from Amnesty International, the Bahrain Institute for Rights and Democracy, Campaign Against Arms Trade and Corruption Watch, all of whom used their evidence to draw attention to the human rights abuses and destruction linked to UK military and political support. In particular, the expert witnesses highlighted the support received by human rights abusers, and the deadly consequences of UK arms being used in war zones like Yemen, where UK fighter jets and bombs have been central to the Saudi-led bombing campaign and the resulting humanitarian catastrophe. The result was met by spontaneous applause from the public gallery and celebrations in the streets outside the court, but its ramifications will go wider than that trial and that afternoon. As it was a verdict in a magistrates court, it may not be legally binding and will have little in the way of informative legal weight in future cases, but it has a clear symbolic value and has set an important political precedent. 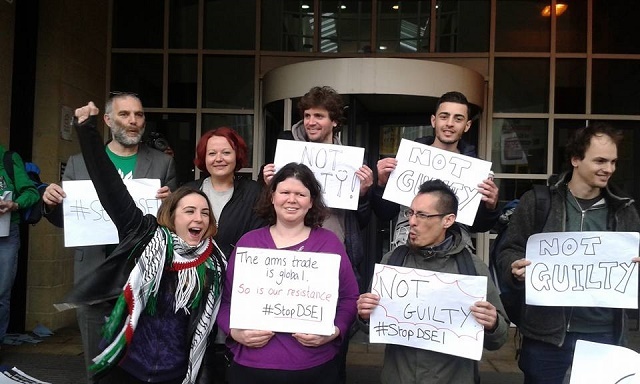 The verdict has helped to expose the moral bankruptcy of DSEI and similar events. The government and the organisers always try to maintain the fiction that it is a well-run and legitimate event. They say that it is part of a ‘rigorous’ and ‘robust’ arms export policy. Of course, nothing could be further from the truth, and the judge’s verdict only provides further evidence of this. Events such as DSEI do not come from nowhere. In fact, they can not happen without government support. Government ministers are key to the promotion of DSEI, so is UK Trade & Investment’s Defence & Security Organisation (UKTI DSO), a 130-strong government department that exists solely to promote arms exports. It is responsible for coordinating the presence of MoD officials and military personnel, as well as inviting international delegations. There are calls for the government and the Metropolitan Police to investigate the judgement, but that won’t be enough. Arms fairs like DSEI can never be legitimate or acceptable. Not only do they strengthen the UK’s ties to dictatorships and entrench the government’s role as a global arms dealer, they also provide credibility and cover for some of the most authoritarian states in the world. Most importantly, they put weapons in the hands of despots and send out the message that the human rights and democracy are of less importance than arms company profits. They can not simply be tweaked or reformed, they need to be abolished. The next DSEI will be taking place in 2017. Already, different groups are talking about how to take action and make sure that this time we shut it down for good. If the #StopDSEI defendants have inspired you, then join us in making a pledge to take action when the arms fair returns next year.